Razer has joined the optical switch revolution with its latest keyboard: the Razer Huntsman Elite. This keyboard utilises Razer’s own Opto-Mechanical switch, a rather interesting take on the optical key switch. No really, it’s quite something. 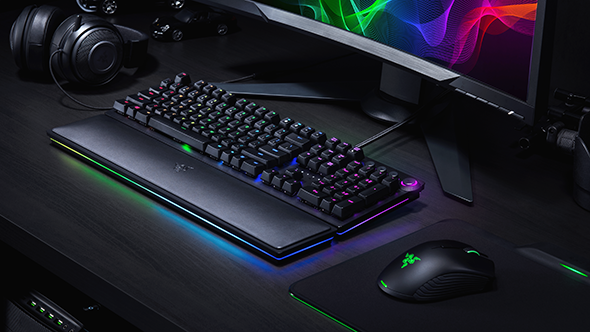 The Razer Huntsman Elite and Razer Huntsman both feature RGB per-key lighting, onboard storage, 10-key rollover, and a simple yet rather appealing aluminium plate design. The Elite model also features media keys, a multi-function dial, and Razer Chroma underglow lighting around the entire board and included wrist rest, which the cheaper model forgoes for a friendlier price tag. Looking for the best mechanical gaming keyboard? Here are the best ones we’ve taken for a spin. Both come with Razer’s new Opto-Mechanical switch. Optical key switches utilise light rather than metal contact points to make a connection every time a key is pressed. There are a few benefits to this design, too. Anti-chatter measures are out the window, they’re swappable without any soldering, and due to the lack of contact points to wear out, optical switches are often rated for over 100 million clicks. Razer is focused on one benefit of the optical switch for the Huntsman, and that’s speed. The Opto-Mechanical switch is the quickest Razer has made to date, with an actuation point at just 1.5mm. That’s just as quick as the Flaretech switch used in the fantastic Wooting One and Gigabyte K9. 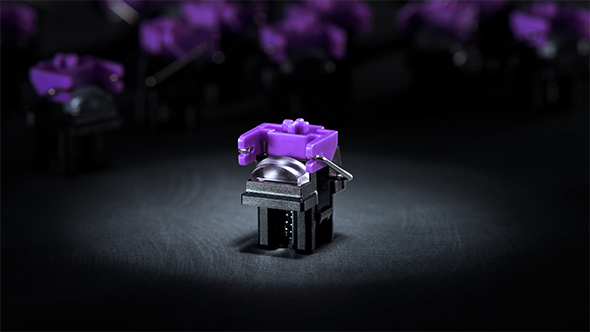 It’s not the quickest switch on the market, however, as many purely mechanical switches not only match the actuation point of the Razer switch, but in fact, surpass it – such as the Kailh Speed switches at 1.1mm to 1.4mm. Also, unlike the Wooting One, Razer’s optical key doesn’t offer any analogue functionality or the benefit of choosing your own actuation point. This means that aside from the improved reliability and zero debounce delay, it’s more or less a straight swap for a mechanical key switch but with stabilisers on every switch. Did I mention the stabilisers on every switch? Stabilisers, normally either MX switch style or wire bars, are used to keep elongated keys, such as the return or shift key, as stable and rattle-free as possible. They are also exceptionally noisy, and the Huntsman has them on every switch. We don’t know for sure how loud that will make the Huntsman, but we’ll find out once we get our hands on a unit for review. The Razer Huntsman Elite will cost you £200, while the Razer Huntsman, without all the extra bits, is on the shelves for £150. Both are available now. It’s heartening to see Razer try something new with optical, although I think this switch tech has far more to offer than just speedy actuation speeds. 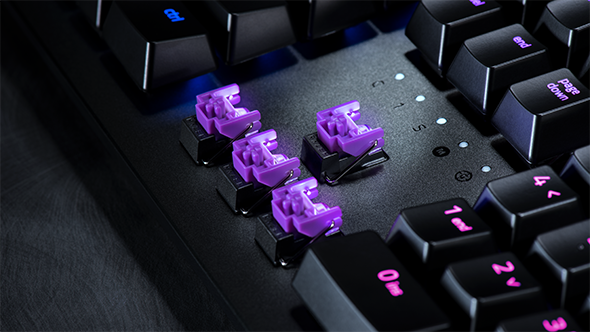 But it’s not just switches that make the Huntsman stand out for Razer. The media keys and multi-function wheel are features we’ve wanted to see for a while from Razer, and no matter how hard I try to resist, I’m starting to feel the lure of that ludicrous RGB wrist rest.